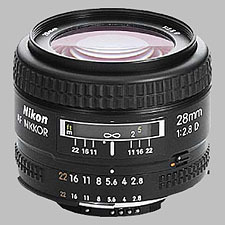 (From Nikon lens literature) Standard wide-angle lens for general photography. Exceptionally light - weighs only 7.4 oz. 74 degree angle of coverage lets you take candids, portraits and travel photographs. This lens is a bit of a sleeper as its quite cheap but does give quite good image quality once past F4. I recently decided to go with primes for all lenses under 100 mm - why carry around a 24-70 that weighs 1.4 kilos when I can get a 50mm, a 28 and a 20 that weigh just about 0.6 kilos between them and still take less room in my bag...and I normally have my 85 1.8 so everything is covered. Somehow there is this ray of clarity that primes provide: it may not show up in tests but I do believe its there. Problems: well I am looking at getting a 35 F2 now as I fell over while crossing a stream when out in the wild and the lens took a not particularly hard knock that rendered it "beyond economic repair" (or what call the "i cant be bothered") syndrome. Not "extra tack sharp", a little distortion...get over it! A simple classic. This lens is easy to carry, performs in low light, classic handling. Primes always bring out creativity because you are not overwhelmed with options and over thinking, sure, some zooms match this lenses performance today, but who cares? You simply pop this lens on your camera, and the charm of it's limits guide you to nice photos. Forget the "bashers"....Just put it in your bag and use it, you will be happy! This lens haven't any cons in FF. I havent'seen any flare, and from f4 the D700's 12Mp are completely resolved. Only the falloff is visible until f5.6, but nothing unexpected. On D2x, instead, the definition is never enough, and is visible a little CA. Small, light, fast, sharp... but I've been really disappointed with the chromatic aberration (colour fringing) on this lens in high-contrast areas of images. Fringing around trees against bright skies have been bad enough to cause a stock library to to reject several otherwise good images taken with this lens. My 24-85mm af-s seems to be just as sharp, and much better behaved when it comes to chromatic aberration, so my 28mm hasn't had a great deal of use. Little on the plastic feel. I purchased this lens used on e-bay, the lens sold new for around $351.00, but can be purchased used between $115.00 to $150.00 U.S. dollars. It is small, and light weight and is a good walk around lens. Since I purchased a AF-S 17-35mm f2.8 zoom, I haven't use this lens as much as I used to. But it does produce very good photo's when used. Great lens. tiny, fast and super easy to use. Great color rendition. On film cameras produces very natural perspective. On digital bodies it becomes 42mm lens - should be very pleasing. Resolution is very good ( excelent at F:5,6)in center, but only good in corners. With med- high barrel distortion, high vignetting (at f/2.8) and pronounced CAs. the AF 28mm f/2.8D is not a bad lens, but as a fix-focal I expected a better performance.